Kampot is a sleepy riverside town, and arguably, the lack of activities is part of its charm. But there are things to see and do if you scratch the surface. The most popular Kampot sightseeing trip is to Bokor Mountain, formerly a French colonial hill station resort and site of a royal summer vacation home. Until recently it was accessible only during Water Festival, but now there’s a new road to Bokor. The road was built to accommodate development on the mountain, which includes an exceedingly ugly casino. But Bokor has its charms as well, including the Popokvil Waterfall and several abandoned colonial-era buildings, including the eerie old Catholic Church and the old casino, two spooky reminders of the former French presence here. If you want a run-down of all of the sights of Bokor, read our “new and improved” Bokor Mountain blog post. 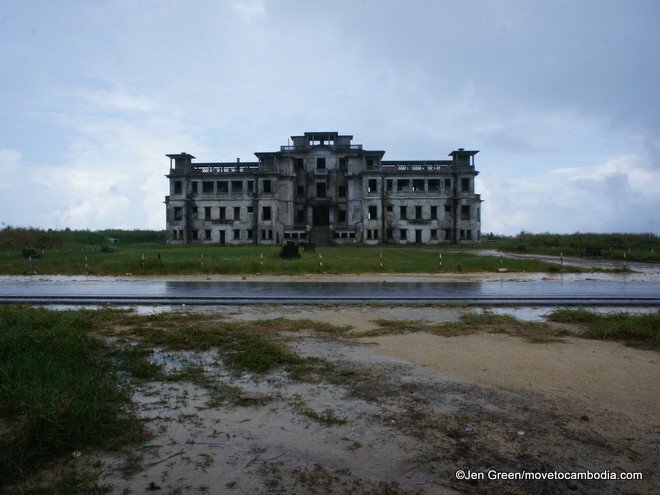 The old Bokor Palace Hotel figured prominently in the Matt Dillon movie City of Ghosts. Bokor is 37 kilometers (23 miles) from Kampot. Minivan tours are $10 per person, or a private taxi is usually $40 for a round-trip visit. You can also rent a moto in Kampot and go on your own — it’s an easy drive, but be on the lookout for reckless drivers on the mountain. A popular activity in Kampot is a half- or full-day countryside tour by tuk tuk. The country surrounding Kampot is beautiful and the views from the road of the rice paddies are spectacular. Tours can include a visit to Phnom Chhnork, the salt flats, a Kampot pepper plantation, the “secret” lake, and even Kep. If you’re after Kampot pepper, Sothy’s Pepper Farm (read our full review here) is the best one to visit, but it’s actually much closer to Kep than to Kampot, as are the lake and salt fields, so if you’re going to both towns, we’d recommend doing the countryside tour from Kep instead. The hard work all paid off with a delicious crab lunch topped off with fresh chili sauce. If you’re staying in Kampot, you can still enjoy all of the pleasures of a day in Kep. It’s a scenic tuk tuk ride away (35 to 45 minutes, costing around $12 for a return trip), or you can take the Crab Shuttle, a boat that leaves Kampot at 9:30 a.m. every day and times its return to catch sunset on the Kampot River. 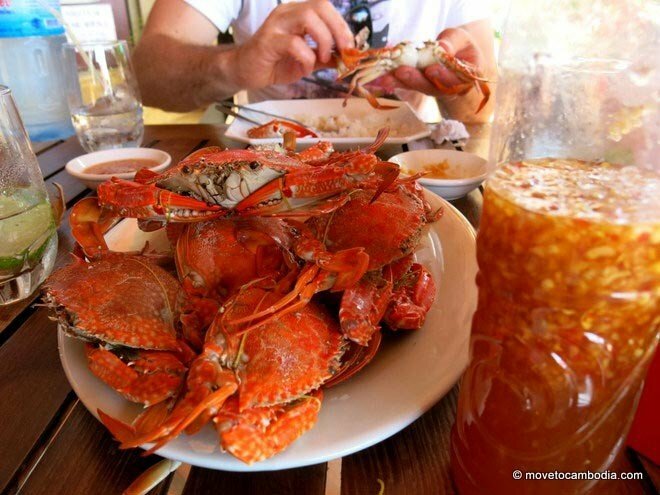 In Kep, we suggest gorging yourself on crab at one of our favorite crab shacks or heading into the Crab Market and buying your seafood directly from the crab ladies. Some of the resorts in Kep will let you use the pool for a small fee, or you can visit the Kep beach and soak up some rays. It is even possible to spend an hour or two on Rabbit Island before heading back to Kampot, or take one of the dedicated boats from Kampot that go straight to Rabbit Island. You can also check out our post on how to get from Kampot to Kep and back again. Kampot is a river town, and there are lots of activities if you’re willing to get wet. Kampot is a river town, and any visitor should spend some time on, or at least near, the river. All of the riverside guesthouses and resorts in town offer a raft of river activities (get it?) for guests and non-guests, including fishing expeditions, river cruises, stand-up paddleboarding, kayaking, wakeboarding, and even water skiing. If all of this seems too ambitious, just jump in and go for a swim. When swimming, be aware that there are long-tail boats putting along the river, particularly around dusk, when they head home for the day, as well as sunset cruise boats, so be sure to stay out of their way. Guesthouses including Greenhouse and Naga House have dedicated platforms for jumping into the river, and Champa Lodge has its own tiny beach. And no, there are no crocodiles in the Kampot river (it’s an urban myth). The salt flats are touted as one of Kampot’s tourist attractions, mainly because Kampot doesn’t have many tourist attractions. When we visited, it was a vast stretch of fetid water that made us want to avoid locally produced salt. However, we’ve heard that when the fields are in production it’s interesting to see the seawater being brought in to be dried and the finished salt being harvested from the flats. End the day with a beer-soaked (or not) sunset river cruise. 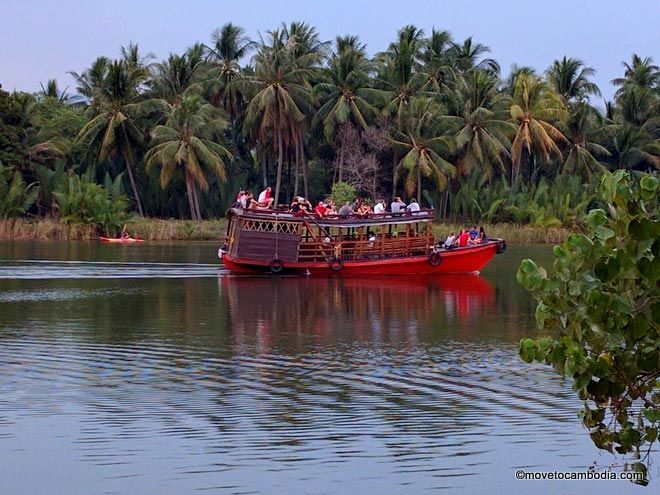 Even if you’re not into water sports, you can enjoy a sunset cruise on the Kampot River. Many of the resorts in town offer their own boat rides or can hook you up with a nearby operator. Travel agents in town also sell tickets, which usually cost between $5 and $10. Drinks are almost always available on the boat, and usually your first beer is included in the ticket price — check before you buy your ticket. Be aware that some of the more rambunctious guesthouses (such as Naga House and Mad Monkey) run sunset cruises of the backpacker-party-boat variety, so if that’s not your scene, consider hiring a private boat through your guesthouse. Captain Chim’s also has a daily sunset cruise that you can book at their guesthouse for $5. 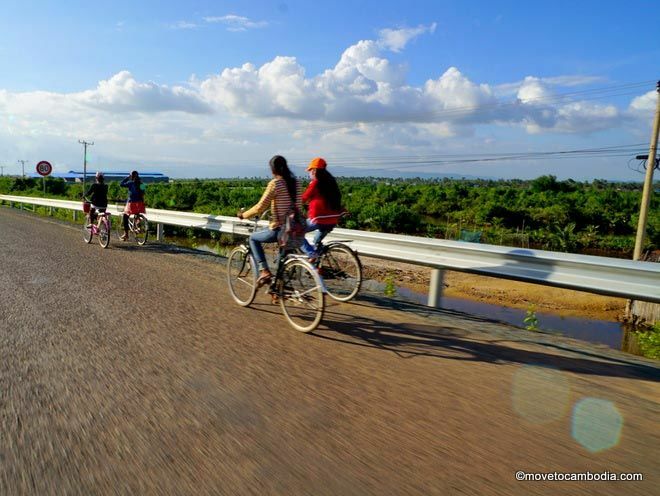 Kampot offers lots of quiet roads with gorgeous views for cycling. You can rent a bicycle for as little as $1 a day from many guesthouses in Kampot. Depending on your level of enthusiasm for exercise, you can take a turn around the stunning rice paddies surrounding Kampot or cycle to Teuk Chhou, a swimming hole about 9 kilometers (5.5 miles) outside of town. Ambitious cyclists can go to Kep, 25 kilometers (15 miles) away, but it will be a hot, sweaty ride. Our recommendation, admittedly on the lazy side, is to just cycle around town and take in the Kampot architecture, then maybe go for a spin just outside of town in the rice paddies before coming home to reward yourself with a cool drink by the river. 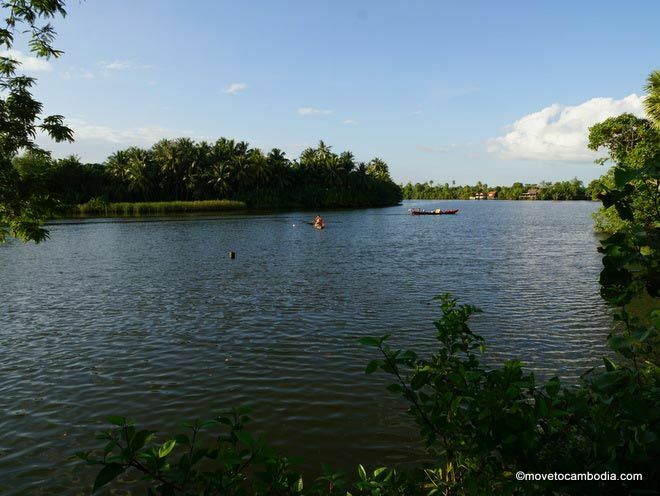 Just outside of town is Tuek Chhou, a swimming hole popular with Cambodian youth and families. It’s an easy 1.5 hour bicycle ride away, or it can be reached by moto or tuk tuk. Once you’re there you can swim or enjoy the hammocks or picnic facilities that are available for a dollar or two, and there are food vendors selling the usual items as well as a few Kampot specialities, such as a local-style num banh chok. Locals refer to Tuek Chhou as a waterfall, but it’s actually rapids that during dry season aren’t very rapid at all. There’s an “entrance fee” of $1 for foreigners, but it’s not official and can be negotiated down, particularly if you speak Khmer.